A real Swiss Army knife of all-around mental ammunition for those of us slugging it out in the trenches of this new century. I’ve spent the last 21 years coaching creative professionals to achieve their artistic and career ambitions. In this book I share 21 of the most powerful insights that have emerged from the years I’ve spent coaching creatives like you—as well as from my own practice as an award-winning poet. I have deliberately kept this book short, so that you can burn through it in one sitting for a burst of inspiration. Or keep it handy on your phone and consult it in the quiet moments of your day, or on those days when you need to dig deep for motivation. 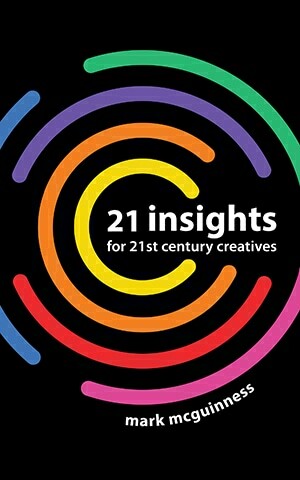 To get the benefit of the 21 insights for your own creative career or business, download your free copy of the book. Mark McGuinness is an award-winning poet who has been coaching creative professionals since 1996. Based in the UK, Mark coaches clients all over the world, and consults for creative agencies and studios. Mark is the host of The 21st Century Creative podcast, where he shares insights on the creative life and interviews leading creators in the arts and creative industries. He is the author of Productivity for Creative People, Motivation for Creative People, and Resilience: Facing Down Rejection and Criticism on the Road to Success. He also contributed to two international best sellers from 99U, Manage Your Day-to-Day and Maximize Your Potential. Mark’s work has been featured in Creative Review, the Wall Street Journal, Vogue US, and on the Discovery Health Channel. Mark McGuinness is a rare cat—part poet, part coach for creative professionals, part old-time, overeducated Brit who thinks deeply about stuff you and I have never heard of … a man who has lived the life and has watched and worked intimately with hundreds of others who’ve done the same. Of all the writers I know, I have learned the most about how to be a productive creative person from Mark. His tips are always realistic, accessible, and sticky. It’s not just talk, this is productivity advice that will change your life.